a bed with body support provided by thousands of tiny soda-lime glass beads suspended by pressurized, temperature-controlled air. The patient rests on a polyester filter sheet that covers the beads. 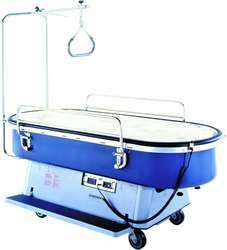 The special bed is designed for use by patients with or at risk for posterior pressure ulcers or with posterior burns, grafts, or donor areas. The pressure against the patient's skin surface is less than the capillary refilling. The improved capillary blood flow to the skin speeds the growth of granulation tissue. Type of bed intended to promote skin integrity and prevent skin breakdown. Within the mattress, small ceramic spheres are constantly blown by temperature-controlled airflow to distribute the patient's weight evenly, keeping pressure off bony prominences. A bed consisting of a mattress filled with tiny glass or ceramic spheres that are suspended by a continuous flow of warm air. The patient “floats” on the mattress with only minimal penetration. Because of the even distribution of weight, the bed is particularly useful in treating or preventing pressure sores. Table 4 is a summary of the costs of resource use in the air-fluidized bed therapy and control populations. Total Medicare costs over the 36-week study period are nearly identical for the air-fluidized bed therapy patients ($16,415) and control patients ($16,800). Patients and their families were overwhelmingly pleased with the air-fluidized bed therapy and had few problems with its use. Of the 47 patients receiving air-fluidized bed therapy, 29 healed to a 2nd stage or better and were removed from the bed. Five were returned to the air-fluidized bed after a recurrence of a 3rd or 4th stage pressure sore. Patients with missing or uninterpretable pressure sore photographs or visiting nurse notes (7 air-fluidized bed therapy patients and 17 control patients) were removed from the review.